Fenugreek is an amazing magic herb that can traditionally recommended for low blood sugar levels, increasing milk production in nursing women and for the treatment of wounds, bronchitis, digestive problems, arthritis, kidney problems, hair & skin and male reproductive conditions. Also used as natural hormone replacement therapy and breast enlargement. 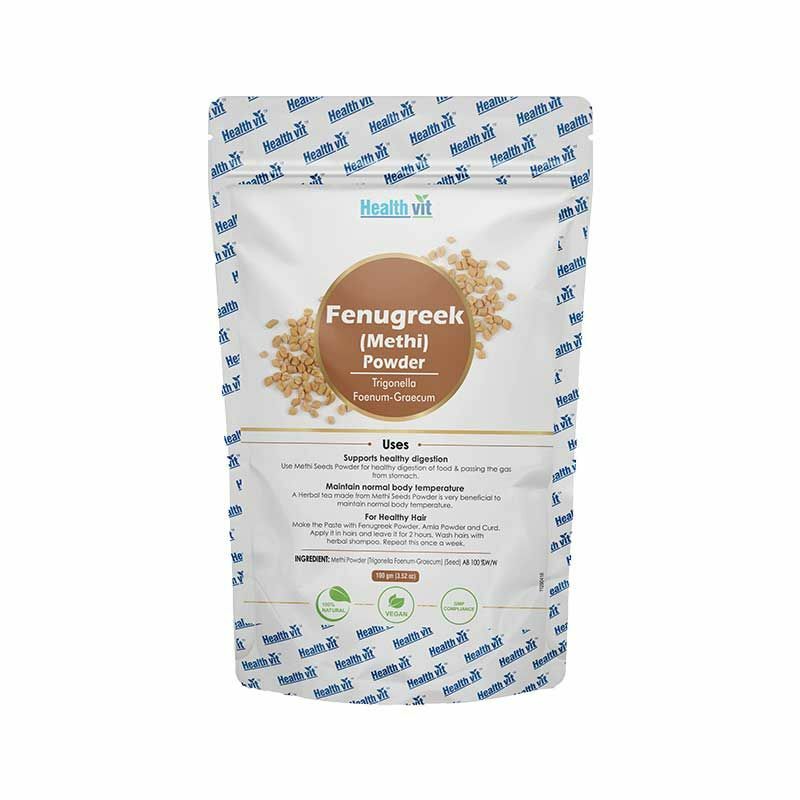 The health benefits of Healthvit Fenugreek Powder includes relief from anemia, loss of taste, fever, dandruff, stomach disorders, biliousness, respiratory disorders, mouth ulcers, sore throat, diabetes, inflammations, wounds and insomnia. It is beneficial post pregnancy in lactation and helps in improving digestion, as well as in various hair care applications. It is also shown to reduce cholesterol levels and protect heart health, while simultaneously boosting the immune system and protecting you against flu and various infections. It contains a wide variety of beneficial nutrients, including iron, magnesium, manganese, and copper, as well as vitamin B6, protein, and dietary fiber. Fenugreek also contains a number of powerful phytonutrients, including choline, trigonelline, yamogenin, gitogenin, diosgenin, tigogenin and neotigogens. About the brand: HealthVit is a Herbo-Nutra (Herbal & Nutraceuticals) segment of Ahmedabad based MNC West-Coast Pharmaceuticals delivering a wide range of quality healthcare products since last 46 years such as Dietary and Nutritional supplements, Medicinal Products and various Skincare Products helping you lead a fit and healthy lifestyle. Their motto is very simple: purest ingredients, stringent processes and high quality guaranteed!